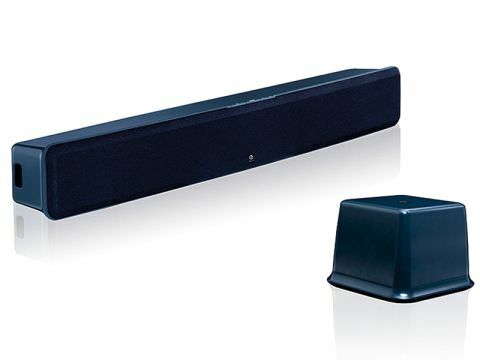 If you thought all soundbars offered pseudo-surround, then you’re in for a shock. Boston Acoustics’ refreshingly simple and effective take on the soundbar genre, its TVee Model Two, sticks with bona-fide stereo audio. Instead of pretending to be a total-home-cinema-solution-in -a-box, it enhances your flatpanel TV’s invariably lightweight sound with a wonderfully crisp, detailed, and punchy speaker that’s slim enough to screw to the wall. The soundbar house a lineup of dynamic drive units (four mid-range drivers and two tweeters) and is backed up by a wireless subwoofer. The sub only needs a mains cable and, provided you set the volume to a suitable level, it does a fine job of keeping up with the little speakers. The only audio cable you need, in fact, is the supplied phono lead that runs to your TV’s audio output. It really is that easy to set up.